I made this up on the spur of the moment. Very simple, very savoury, and very delicious. In fact, I made it so quickly and didn’t expect it to be very special, that I didn’t take any photos until I took the first mouthful after serving it. Rather than posting this in a recipe format, I’ll just describe what I did, because the essence of this dish is its spontaneity. 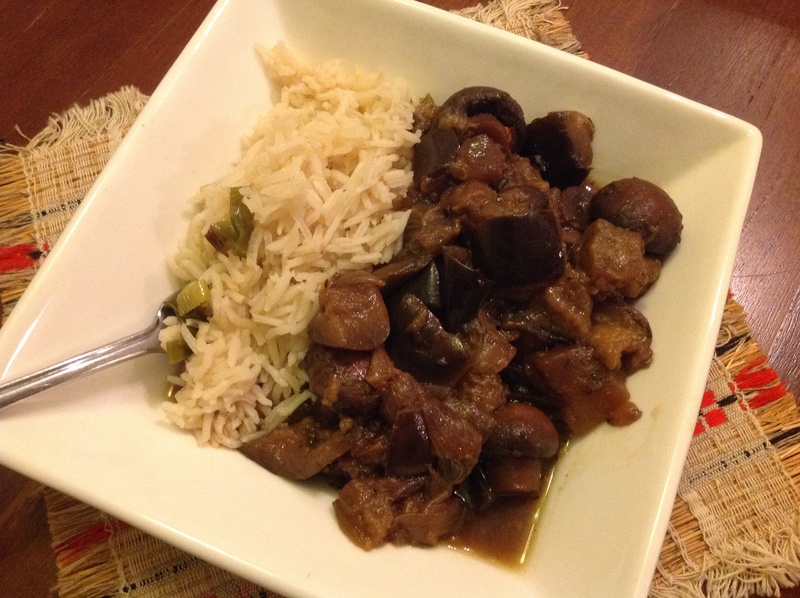 I sautéed a cubed eggplant, a pack of swiss brown button mushrooms, and a roughly chopped red onion in about two tablespoons of ordinary olive oil. Then I added a half teaspoon each of dried thyme, oregano and sage, and then deglazed with about half a cup of dry white wine, and let it reduce a bit. 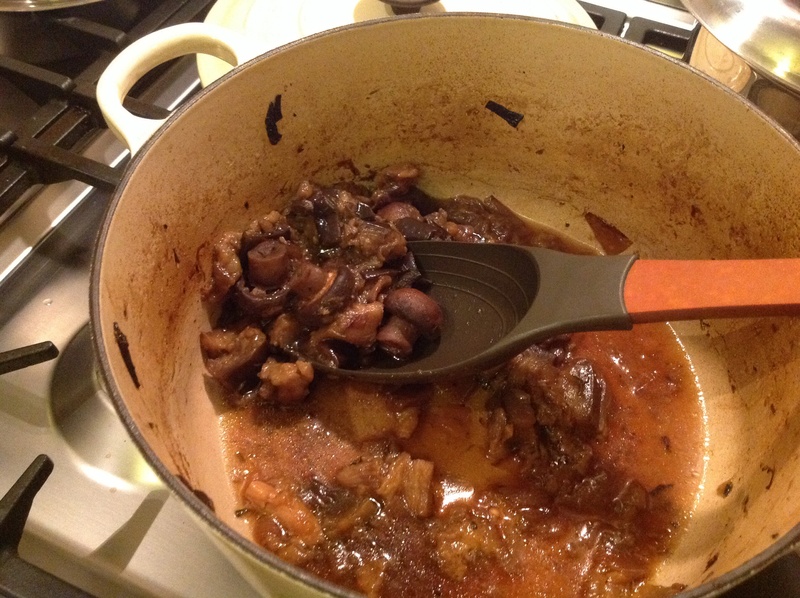 On top of that I poured about a cup of vegan beef-style stock (one stock cube of Massel). When it came back to a simmer I put on the lid and put it in the oven on about 150C for a couple of hours to slow cook. It was delicious with Basmati Rice Pilaf, but I think it would go well with Cauliflower Mash too. This amount made two servings. I love how authentic your blog is! This is a vegan blog with ingredients I can actually find at my local supermarket and keep in my pantry regularly. There is so much less fuss and muss on your blog compared with many other vegan blogs (which I also love) but these recipes seem so.. attainable! Plus I often feel that I overdo the carbs a little as a vegan so it’s nice to see you focusing on high protein in a lot of recipes 🙂 hope you keep on posting! Thanks Erin. I will keep posting… I have spent the last few months very busy with work and these recipes have been in frequent rotation. But I will come up with new ones.